Lesson 8-A Closer Look at Communities - Fun With Science! Reflection- Why do you think this group want their "warriors" to work to protect the wildlife nearby versus to kill them? Why is it important for us to keep those at the top of the food chain around? Students writes their opinion in Science Journal- Share some thoughts. Read Wolf Island by Celia Godkin. Access Teacher's guide and author's website here.Great discussion questions on interdependence and population growth. Refer back to reflections shared at the beginning of the lesson- did what happened in the story change your opinion? How and Why? Reflect again and add to Science Journals? 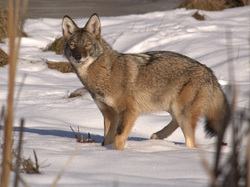 Wolf Hunt* activity to simulate how animals compete for resources within their communities. Discuss what students observed as they played the part of predator in this activity and how it related to what we read earlier in Wolf Island. Analyze cause/effect for the major events that happened in the story and in the activity. Through dialogue help students infer that the size of the animal population depends on the amount of available resources.Discuss what that means when we look at other communities- like ours. Conclusion- Play the first 6 minutes or so of Nature Works Video. This video discusses how animals become extinct and endangered. Talks about water quality and how habitats are being disturbed as coastal cities grow. Wolf Island by Celia Godkin- Based on an actual event this book tells the story of what happens to a community of animals when a group of animals disappears for a time. It demonstrates the impact that a delicately balanced ecosystem feels when a family of wolves leaves for a bit. When the family returns to the island balance is returned to the island. This story addresses what happens in all food chains when the highest link is removed. Nature Works Video-"LIfe At Risk", New Hampshire Public Television Website, http://video.nhptv.org/video/1492029890, accessed March 5, 2013. "Warriors for Conservation" Video, National Geographic Videos- Explorers- In the Field Videos., http://video.nationalgeographic.com/video/specials/in-the-field-specials/bhalla-warriors-for-conservation/.